As confusing as spring weather can be in Northern Colorado, I think it's finally safe to say that spring has sprung! This will be our first spring since we had the house painted, so I've been excited to accessorize the porch and show off our newfound curb appeal! While the original tan color of the siding wasn't horrible, the house was in need of new paint when we bought it so we jumped on the opportunity to give our home a little bit of an exterior makeover and make it our own. 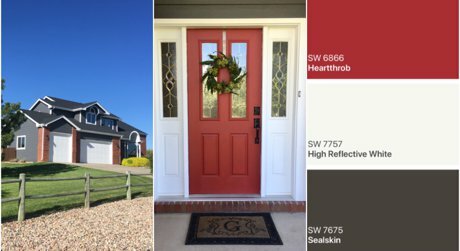 Deciding on the primary paint colors was easy, as I'd already been eyeing some of the beautiful grey homes with white trim when looking at real estate listings for our clients. The most challenging part, believe it or not, was agreeing on the color for the front door. We originally decided on red, then second-guessed our decision because we were worried it would clash with the color of the brick. After having the door painted a mustard yellow, which I liked but was probably too modern and trendy for the style of our home, we ended up going back to our first impulse and repainting it red after all. I'm a huge fan of Shade Brothers Painting for a few reasons, but the most relevant is that they did a fantastic job painting the exterior of our house. We've had several friends and clients hire them after seeing the work they did for us, and I'll continue to pass their contact information out and hire them on future projects. As a small family business ourselves, we always try to support other small businesses in the Northern Colorado community, and it's easy to do in this case! You might also notice that the color of the roof has changed. Okay, probably not because it's a very subtle change, but I'm gong to talk about it anyway! In true Northern Colorado fashion, our roof and some of our windows were damaged in a hail storm last year, so we finally had those replaced. It honestly had never even occurred to me that we could change the color of our roof, but once it did I was pretty excited move away from the dark brown to a deep charcoal that would match our new siding color. Pachner Exteriors, another great family owned and operated business, did the work for us and also helped with the claim on our home owner's insurance, making it a surprisingly easy and seamless process. Lastly, I had some fun accessorizing the front of the house and the front porch. I always put a wreath and flower pots out, but other than that our porch has sat empty since we moved in. Our time outdoors is spent in the backyard, mostly because we have two kids and a dog that need a fully fenced area to play in so this wasn't a priority to me. It occurred to me, however, that our front porch is the first thing people see when they come as guests to our home and it was time for me to pick up the ball and make this an inviting space! You can't see them all in great detail in some of the distance photos, so I have some closeups of my favorite accessories below. Updating light fixtures is always a pretty impactful change to make, so we opted for a nice oil rubbed bronze lantern style light by the front door, as well as the garage doors. This coordinated well with the new oil rubbed bronze hardware on the front door, as well as in the interior of our home. 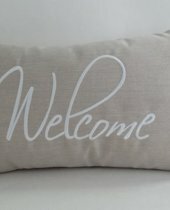 I absolutely love my stunning new handmade welcome sign and the custom outdoor pillows that took a standard bench and made it look like a cozy place to sit. While I wanted to make this a welcoming space, I also didn't want to spend hundreds of dollars on an outdoor sofa when I know it's not going to get much use. A bench, some pretty flowers, and a few gorgeous handmade accessories from two of my favorite etsy shops did the trick! 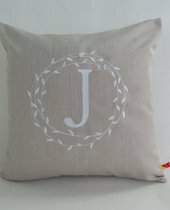 As an added bonus, working with etsy shops is always such a fun process as you get to chat with the person who is actually making your product, and sometimes be a little creative by customizing the items. Plus you're supporting small business and local artisans, so there's no downside!